Thanks 🙂 I expect I enjoyed drawing this picture, although I used to get a bit frustrated with recalcitrant waxy colouring pencils on cheap school book paper! I got marked 9/10 for this picture. From what I’ve seen, your drawing is definitely better than that done by my 8 year-old self! To make a comparison, I’d need to see a sample of one of your drawings from childhood! My mother recently presented me with a pile of of my old school books that she’d kept. It was very entertaining going through them. The ones for maths were less than impressive, though. A very creative child. Great picture, the details. Writing mine but mom kept sending me to these free art classes. They were fun but I don’t think I have much of an art talent. I liked doing writing in my free time. Wasn’t so keen on doing it in class, as there were too many blocks put in the way of my free expression! Same goes for set books for Literature classes — not my kind of reading most of the time. 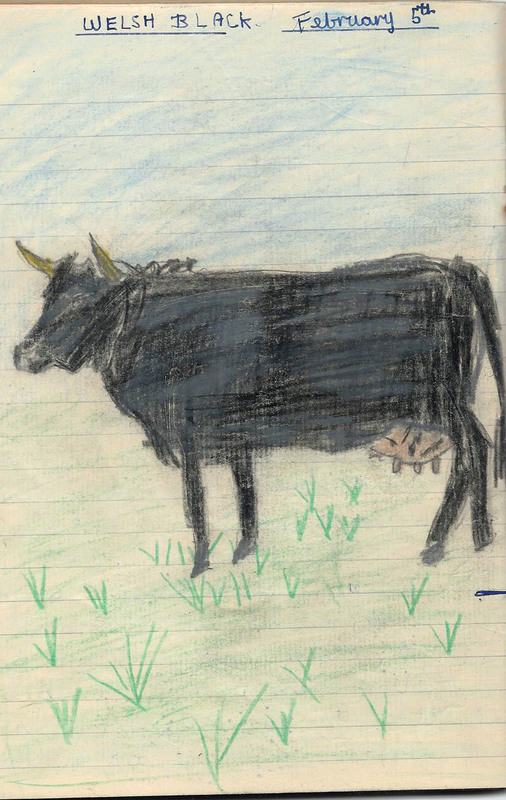 It’s very good Sarah, you’ve really captured the spirit of the cow – I’ll bet you developed into a good artist! For an eight years old it is a fine drawing. You might illustrate this blog now and then. You definitely have a talent. I’m probably rather rusty at painting and drawing by now. Have been concentrating on my writing and, to a lesser extent, on music. If only I didn’t need to sleep, then I’d have 24 hours a day to be creative in numerous directions, instead of having to fine down my choice!